Agile Cigar Reviews are cigar assessments where we use a lightweight, shorter format. These will never take the place of our comprehensive reviews. They are only used on blends we have previously assessed. This might be a blend we are re-scoring or giving a score for the first time. It might be a blend we are looking at in a different size. Today we look at the 1502 XO Lancero by Global Premium Cigars. This is a cigar line we have assessed several times before, most recently back in June 2018 in the Salomon size. Back in 2015, Global Premium Cigars announced its most premium line under its 1502 brand known as the 1502 XO. The XO is a limited production line that incorporates 18-year-old tobacco into the blend. In 2016, the 1502 XO made its debut in a Toro size. Since then (at press time), six other vitolas have been released. 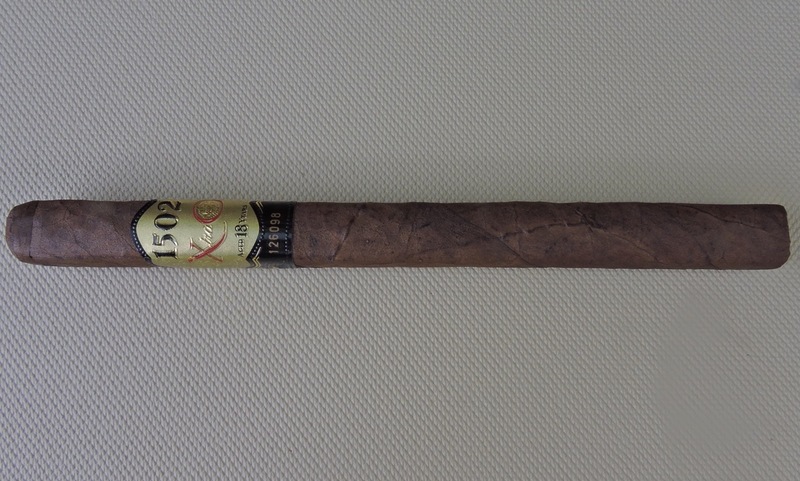 Today we take a closer look at the fourth installment of this series, the 1502 XO Lancero. This is a cigar that has been resting in the Cigar Coop humidor for 11 months. Following the release of the 1502 XO Toro in 2016, the U.S. Food and Drug Administration (FDA) announced the Deeming Regulations on premium cigars should go into effect on August 8, 2016. Because cigars released after that date would be subject to a more rigorous pre-market approval process, Sanchez made the decision to soft launch the seven other sizes of the 1502 XO line at the 2016 IPCPR Trade Show that took place a few weeks earlier. At the same time, he opted to stagger the full launch of those seven other sizes. Below are the other sizes and dates the went into availability. The supply of 18-year-old tobacco limits the production of the 1502 XO, so these were done in smaller batches. Global Premium Cigars CEO Enrique Sanchez Icaza made the decision to do a soft launch of the seven other sizes of the 1502 XO. However, he has staggered the full launch of the cigars. The 1502 XO Lancero is a 7 x 40 box-pressed cigar that features the brand’s signature “cigar lock” – which is a partially covered footer around the edges. As for the blend, other than the 18-year-old tobacco that was procured, Sanchez isn’t disclosing any information other than that the cigars are made at the Plasencia factory. The 1502 XO Lancero started out with a mix of red pepper, chocolate, cedar, and natural tobacco. At the same time, there was some red and black pepper on the retro-hale. During the first third, the natural tobacco moved into the forefront. The chocolate and cedar occasionally popped into the forefront, with the chocolate coming into the forefront a little more frequently. The pepper was prominent on the retro-hale. There was also a slight amount of citrus that emerged. By the second third, the citrus and cedar components increased in intensity. Now the cedar notes were more frequently popping up from time to time in the forefront than the chocolate and the chocolate component diminished. Meanwhile, the pepper increased on the retro-hale. The final third saw a combination of cedar and natural tobacco as the main flavor combination with the pepper and citrus notes secondary. This is the way the 1502 XO Lancero finished up. The resulting nub was firm to the touch and cool in temperature. The 1502 XO Lancero delivered a medium-bodied smoking experience countered by strength on the upper end of mild to medium. One thing I did notice, my experience smoking the 1502 XO Lancero was more dialed back than the other sizes. It is possible that this was because the Lancero had additional age on it. I’ve written this before. When it comes to lanceros, I’m not ready to embrace them as the best size of a blend. The 1502 XO line has been a great line released by Enrique Sanchez Icaza, but I’m afraid to say when it came to the lancero, it fell short of the other sizes I’ve smoked in this line. Yes, the 1502 XO Lancero delivered many of the core flavors that I found in the Toro, Churchill, and Salomon sizes (the ones I’ve smoked), but in the 7 x 40 box-pressed format, they didn’t quite come together as I would have expected. It’s not a bad cigar and while this is a still a cigar I’d position to a novice or experienced cigar enthusiast, I’d recommend one of the other sizes I listed above first.